After a few days of observation, I confirm now that my baby knows how to call me. She calls me “Ma Ma”. Starting from few days back, I already heard she called me ” Ma Ma”. However, I just want to make sure is she really refer to me. So… I just wait for a few days and observed carefully. Now I am happily announcing it to all of you that when she said ” Ma Ma” , she does mean mummy. How would I know? Once she saw me come out from the bedroom every morning, usually she will straight away hop into my arms since last 2 months I think. But now, before she can reach me, she will call out loud “Ma Ma” first. Also, every time when she prepared to walk to me, she will call “Ma Ma” too. 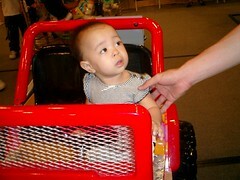 Then, if she knock on something and feel hurts, she will also cried out loud with the word “Ma Ma” almost immediately. At the same time, she will look for me, or walk to me straight away if I am around. Actually, it’s rather obvious that every time when she wants me to carry, she will call “Ma Ma” too. Now, almost all day long I can hear her keep calling “Ma Ma”. It’s like “Ma Ma” this, “Ma Ma” that… non stop. Do we really need the rod? I guess caning kids had never been the culture of my family. Even as early as my grandfather, he never cane my mum. And, of course, my mum never cane me as well. However, we still have cane in the house. But, that doesn’t mean we have to really cane our kids. In fact, the cane is mostly used to frighten the dog. I will give you a good example why we shouldn’t cane our children. My hubby has been cane by her mum when he was a boy. And, he practically tell me every now and then that he will never do that to his girl. And, as for me, I feel proud of my mum every time when people told me they’ve been cane by their parents during their young days. Just ask yourself a simple question before you use the cane, if you believe canning can solve the problem. I believe there are so many other ways to discipline our kids. It is not necessary to use cane. I still strongly believe that our kids will appreciate it so much as they grow up, if you never cane them. At least, I did. I guess that’s it. That’s what I want to share here. Thanks to Judy Chow and shoppingmum. So, let’s see what these mummies have got to say? 1st – You leave their blog and post link and add to the list below. 2nd – Let the blogger know that they have been tagged by leaving comment in their blog. 4. Everyday Healy no rod for kids. Actually, I bought it quite some time ago. At first, we adults are the one who get excited with this sunglass. Always wanted to put it on for her. And, she will took it off immediately. She prefer to let us wear it. She really just enjoy take it off from us at that moment. But, as we praise her when we put it on her. She finally likes it. And now, she understands that’s hers. Whenever she asked for my sunglass, I will give her hers. She can accept that, but sometimes she just want to play with both. LOL! Naughty Elizabethl! See what I’ve got here. I am going to cook spaghetti with traditional tomato source for my girl. This is just a simple baby food recipe that I created myself. And, it’s really easy to get it serve as most of the ingredients are readymade. 4) Add only 1 or 2 teaspoons of the readymade tomato source. 5) Cut the spaghetti into very small pieces. And , serve it. However, I am still learning through some cookbooks and family recipes online. Hopefully I can make my own source soon. So that my little Lizzy can enjoy a healthier meal. This is Elizabeth’s new toy phone that daddy just bought for her this Sunday. She already learn how to talk on a phone about a month ago. Thus, she likes phone. Most importantly, she will ask for something whenever we bring her to a shop. If she has nothing in her hands while when we walk out from the shop, she will start crying. OMG! She might just be another future shopping queen! White is always my favorite color for clothing. And, look what I’ve chose for my girl — a beautiful white princess dress for her 1st birthday. I think she will certainly looks gorgeous in this dress. And, it’s best if she likes hair band. However, I am sure she will take it off as soon as I put it on her head, just like what she did to her hat. Thus, I am still looking for the right accessory for her to go with this beautiful dress. As I search around, I had fell in love with a beautiful silver jewellery online. It’s kind of dainty. This child’s’ silver bracelet with single coin pearl has showed its simplicity at its best. I think this fantastic designer jewellery will match her dress well. I wonder if she likes it too? Looks like Elizabeth got her first tag here now. This is sweet as she just get her first award for this blog about a week ago. Really thanks to this vain mummy who has sent this first tag to mummy. However, mummy thinks it’s more appropriate to do it here rather than in her personal blog cause it’s about “The age that I wish my child will stay to be “. It’s really hard for mummy to decide as I am still so young. However, I think she would prefer me to grow up faster and stay in the age of 3 or 4. This is because through her experience of teaching in Kindy before, she still feels children in the age of 3 to 4 is really cute and lovely. But, Dear Elizabeth, just take your time to grow cause mummy enjoy every moment of your growing time. In fact, no matter how old are you, you are always my little girl. Finally, mummy will pass this award to your little friends now, ok? And, this award goes to…. Well, That’s it! Not very excited. Kind of curious. Busy looking around. But, not afraid at all. Brave girl! But, why don’t you turn around and look at me when mummy keep calling you? Mummy is getting busy with other matters nowadays. She don’t blog much for the past 2 weeks. But I guess she just need some good rest. Then… here she is again! She better did as I don’t want her to miss out all my moments. These magical moments of mine being a baby would be something worth keeping records of. That’s what my dad said. 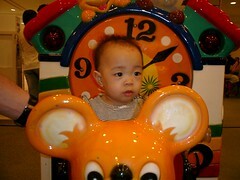 He is the one who only left with one piece of baby photo for his early childhood. Poor thing, aye? So… what am I doing today that worth noting down? Mum thinks should be this one below. I just play with this soft and sticky ball for the whole afternoon while listening to classical musics together with mum and grandma. I think those are great songs. Thus, I even clap for them. This ball with smiley faces was bought long ago. That time I am just about 4 months.I don’t appreciate it at all at that time. Mummy asked dad to get it for me when someone sell it in a restaurant, thinking of I might love to see the multicolors light blinking. But, mum told me I don’t even look at it when I first got it. I think mum is going to show you more of my new clothings. Yeah… she bought many of them last weekend. Oh! I seldom crawl on the floor anymore cause that hurts my knee. I prefer to walk now, especial in the house. In fact, I am kind of excited every time I walk on my own. Feel so amazing! It’s unbelievable. Finally, I walk. Thus, I am always smiling as I walk. Just like this. Since my one and only fever experience, mum getting worried about me getting cold sometimes. 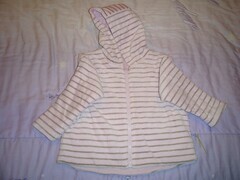 So, she keep searching for baby jacket. She saw many. But, she still think it’s not something for me. (Yeah… she is always very particular when choosing my clothes.) Thus… she just keep looking for the right one. Here it is. 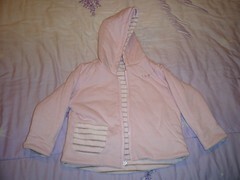 my 2 in 1 baby jacket. Yes! This is a jacket which I can wear both sides. So, instead of one, I got two jackets now! Sometimes just plain pink; Sometimes pink in stripes. Fun, aye? Nice? She eat every 2 to 3 hours. In between, she take lots of snacks too. In short, she really can eat a lot, but still not big enough. She likes porridge cook with pork and many types of vegetables. Still drinking syrup — Ribena rather than plain water. She enjoy taking steam or bake fish now. Still taking lots of organic jar fruits as snacks. Thus, no constipation problems. Biscuits and bananas are her new preference. She can claps, loves to point, do twinkle twinkle little stars with her fingers, showed “good”, she knows how to press all the buttons of remote controls, calculators and mobile phones. She can squat. She can turn round and round just by sitting on the floor too. Cute! In terms of play pretend, she can talk in the phone, drinks with cup, hug her soft toys and sing. She likes her dad to chase her around too. She knows how to run away. As she try to run away, she will shout and laugh. She still likes to roll on mummy’s bed. But, she likes to lay down lazily on the sofa or pillows too. However, she will never lay down on a hard surface like the floor. May be she already understand that’s hurt! She knows how to say “nan nan” means milk. She enjoy songs nowadays. She will ask me to continue singing for her once I started. She will go back to sleep again once I sing twinkle twinkle little stars if she wakes up middle of the night and cried. Easy for mummy, aye? She is now crazy over baby Einstein, she can watch more than 3 times a day. Did I mentioned last month that she usually will instruct you to go to the VCDs, and put on her show if she don’t like what’s on the TV now. She still will take off her shoes every time I put them on. She can remember and recognized the things you showed and pronounce to her almost immediately. But, she still don’t really enjoy learning with flash cards or books. She only likes to flip them. She is now learning how to put things back once she take it out. For instance, once she take off her dad’s sunglass, she will try to put it back on his face immediate. But, she still not “pass” yet. The only thing is you will see her gaining satisfaction and smile happily once she successfully put it back. She learn how to scold things or people too. Few days ago, she knocked on a chair. She keep going round the chair, pointing at it and grumbling non stop. OMG! So long winded and revengeful. I used to afraid of the sounds of people’s clap when I was a baby until about 6 months old. Strange aye? I really don’t know why… it’s too loud may be; or too sudden most of the time, a bit unprepared. Thus, I must learn how to clap too. It’s fun! Finally, I made it since last week. And, I keep showing my new talent to everyone who requested it. Sometimes, I just did it myself. Just for fun! I know there are so much more to learn. I am working hard on it. Oh! I woke up about 8am that day. I just had enough Zzzz. So fresh and have great mood. May be because mummy wake up together with me. Then, mummy switch on the TV for me since I don’t want milk milk. Oh…Yes! Cartoon! I like it! So I agree to sat on the bumbo seat. I just won’t feel easy if I just keep my hand empty. So… I pick the handkerchief beside.